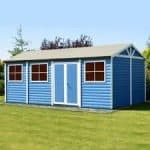 This is a good quality storage shed, and it has a few features that make it a strong contender if you are looking for somewhere to store your items with peace of mind. One of the key features here is the tongue and groove cladding. This exceptionally strong cladding means that you have a watertight building, as well as one that has a strong outer shell. The tongue and groove locks together and provides you with a more robust building. It was nice to see tongue and groove in such a building, which is at a lower price point. The building is quite spacious too. It is easy to get a large number of tools, a workbench and a small piece of equipment or two inside. 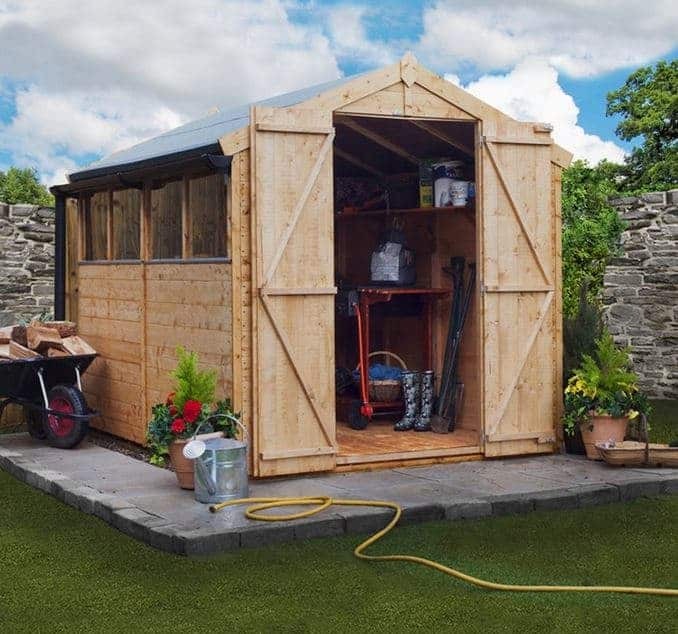 In other words, it can be used as a workshop as well as a simple storage shed. 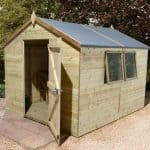 There is plenty here to like, and if you plump for a few of those extra customisation options, you can really make it a shed that is a truly exciting place to be. 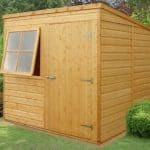 This is a storage shed that measures 8 x 6. 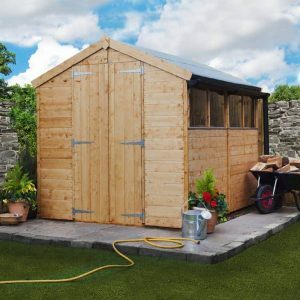 It has a traditional look and feel, with an apex roof and large double doors. 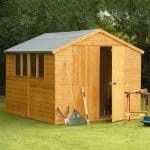 Perfect for storage, it also has windows that provide plenty of natural light. The building measures up at 202 cm wide. This shows that you have a decent amount of storage inside. 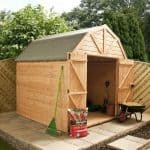 Due to the thickness of the timber that is used to make the shed, you do lose a little bit of space inside, and the internal width is 181.4 cm. You won’t notice this, but it’s important that you know how much is lost. The depth of the building (or how much it ‘goes back’) is 238.8 cm. Internally, this reduces to 234.4 cm, and this again is not that noticeable. That apex roof contains solid sheet material, which provides considerable protection against rain, as well as a strong covering for the building. On top of that sand felt is supplied as a roof covering. Combined, these two elements make for a strong and resilient roof. With the barrier of the felt on top of solid sheet, the interior will be kept dry. It’s important that an outdoor building has good cladding because this is a strong line of defence against rainwater. Without solid cladding, rainwater simply enters a building over time and creates rot. With this shed, you have tongue and groove cladding. This is a very good thing, because tongue and groove is really some of the best material you can have on an outdoor building. It is strong first of all, because the timber planks are locked together solidly. This gives them extra weight. And in addition to that strength and weight the interlocking aspect means a seamless, smooth sheet, which gives full watertight protection. You do get a chance to choose a floor, and there are two distinct choices here. You can have solid sheet flooring (the same make up of what is in the roof) or tongue and groove. We think tongue and groove, due to that watertight aspect, will make for the best solution. It is also strong enough to give a solid flat surface over time no matter how heavy the footfall is, or the weight of the machinery you store. The building does not come pre-treated, so any treatment is up to you. Do this annually, as well as on delivery. Missing treatment could mean voiding the warranty, which lasts for 10 years on this product. You get a nice amount of window space here, with four fixed windows in the building. They are all on the side, and they are large enough to supply the interior of the building with plenty of natural light. They are fixed, which means you cannot open them, and therefore have to rely on the door for ventilation. 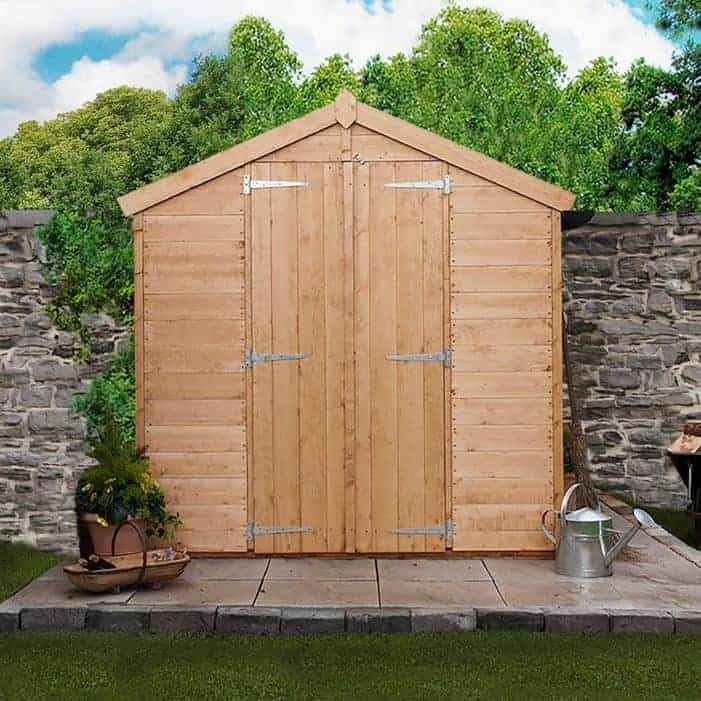 The double doors open up to 166.5 cm in width, giving plenty of room for access no matter what you need to store. There is no lock provided, and this puzzled us to be honest. You will need to buy a lock and get it fitted yourself. It’s not expensive as a process, but it would have been nice to have some kind of door item to make this building more secure. Alongside being able to choose your floor, you can also choose shelving. 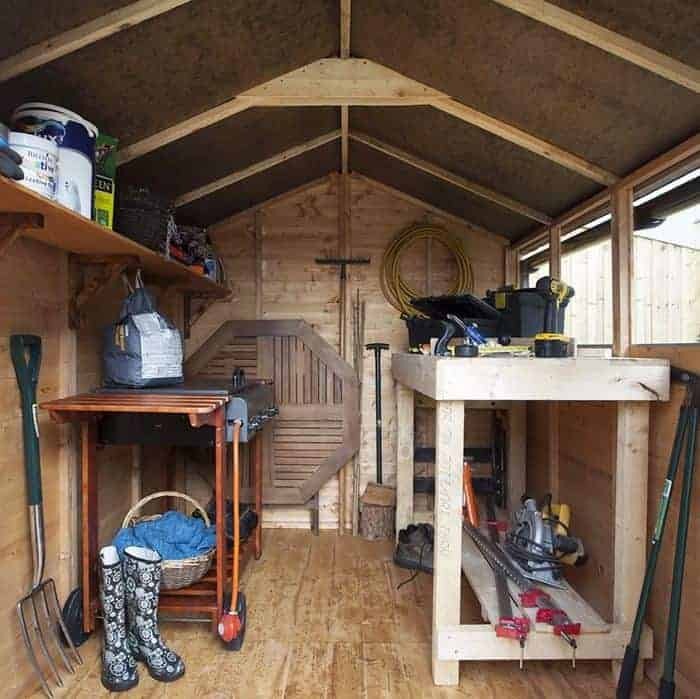 This makes perfect sense for a storage building, and we fully recommend that you choose as much shelving as you can manage, Having an inside that is capable of that extra bit of storage makes all the difference. You can also choose your base. You could have bearers, for example, which are simply a prop for the building, keeping it off the wet grass. Or you could opt for a full Eze Base, which is what we recommend. 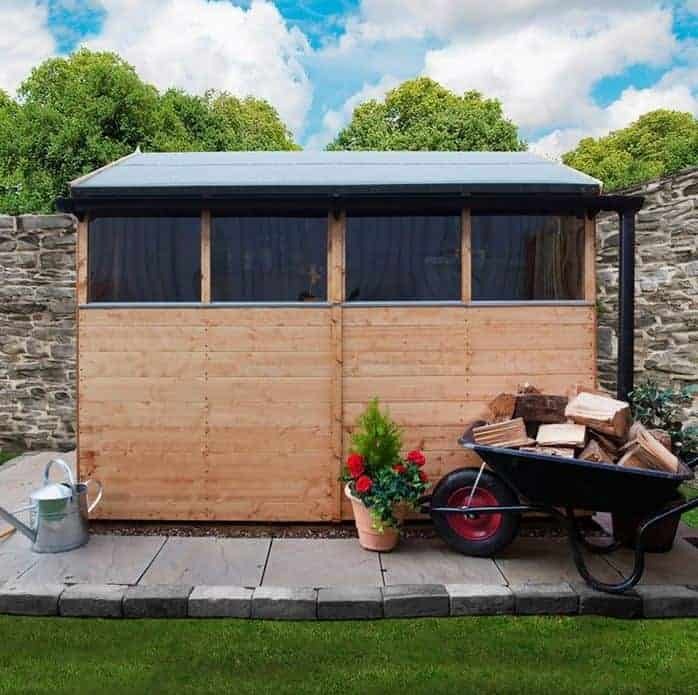 Easy to put together and perfect for keeping your shed raised and dry, it isn’t very expensive either. One of the best aspects of this building as regards quality (if not the best) is the tongue and groove cladding. It’s tough, and it ensures that the building has a long life. We liked the apex roof, and the large double doors too. Get it treated as soon as possible and the solidity of the building and the cladding should ensure you could look forward to at least 10 years of life. 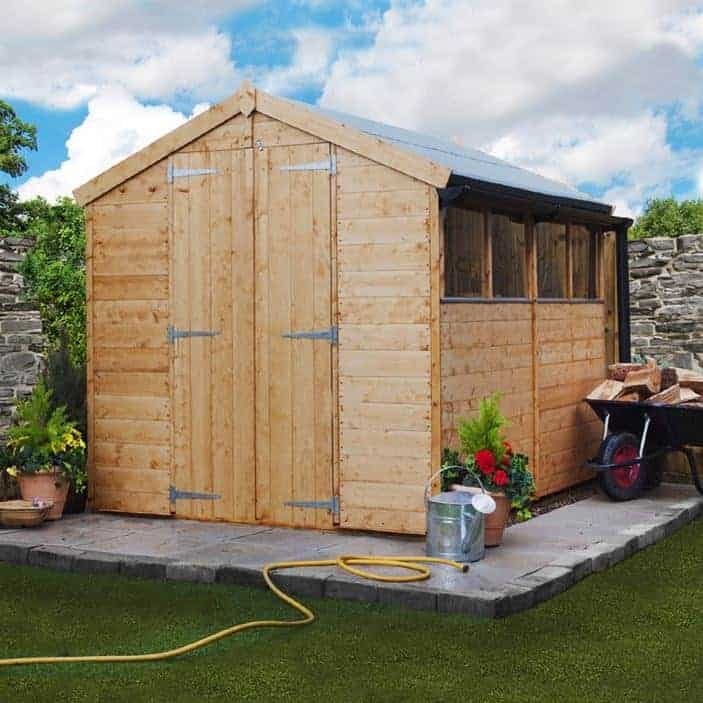 For the price, you get a decent-sized shed here. You can easily store a large number of tools and still walk around comfortably inside. So plenty of space is available to you. And if you add that shelving, it’s a great place to keep your stuff. It needs treating initially, which takes some time. But once you are up and running, you should be able to get this finished in two days. Plenty of value here, and this is especially true of the tongue and groove cladding, which you don’t normally get at this price point. The spacious interior means you can store a lot, or simply curl up with a good book on a sofa. 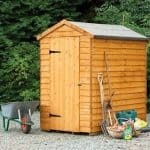 Final Thoughts: This is one of those sheds that have a lot more to it than we first think. There is a good size interior, in which you can easily store a number of tools and items of equipment. You also have a nice-looking apex roof that really gives the whole building a pretty and traditional tone. But we cannot ignore the tongue and groove. This stuff is quite costly to make, and to have it in this low-cost building is a nice treat. It simply means your building is immediately stronger, and able to withstand poor weather better. It also looks good and we think this is a key factor. Add to that the fact that you have plenty of options with regards to customisation, and the whole package is very attractive.